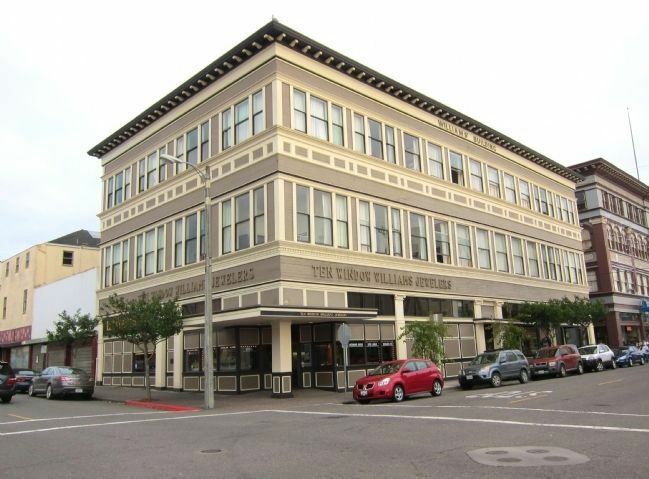 Needs Lodging; meeting hall; jewelers, tailors, other retail; offices; L.H. Hess businesses; Monterey Hotel. This program made possible through a partnership with property owner Williams Family, Eureka Main Street, and the Eureka Heritage Society. Erected by Eureka Main Street, Eureka Heritage Society. Location. 40° 48.207′ N, 124° 10.038′ W. Marker is in Eureka, California, in Humboldt County. Marker is at the intersection of 3rd Street and E Street, on the left when traveling west on 3rd Street. Touch for map. Marker is at or near this postal address: 404 3rd Street, Eureka CA 95501, United States of America. Touch for directions. The marker, barely visible here, is mounted to the 3rd Street side (picture left) of the middle of the building. (about 300 feet away); J. Lowenthal Building (about 300 feet away); August Palmtag Building (about 300 feet away). Touch for a list and map of all markers in Eureka. More. 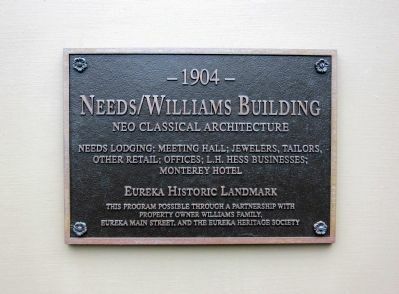 Search the internet for Needs/Williams Building. Credits. This page was last revised on June 16, 2016. This page originally submitted on November 26, 2012, by Andrew Ruppenstein of Sacramento, California. This page has been viewed 316 times since then and 2 times this year. Photos: 1, 2. submitted on November 26, 2012, by Andrew Ruppenstein of Sacramento, California. • Syd Whittle was the editor who published this page.